Sorry I don't have my own picture for this post, but I threw it out when I was on holiday and I am clearly not a pro blogger. 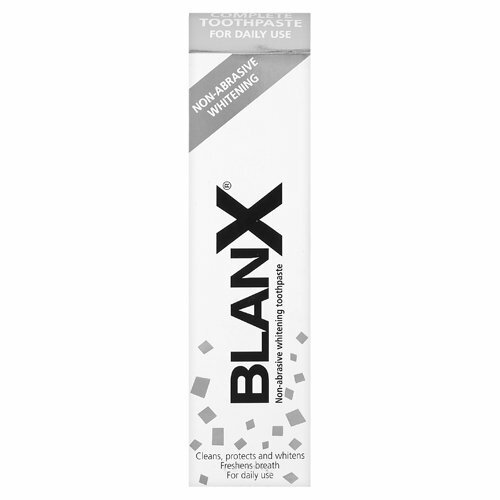 But I just finished my tube of Blanx Whitening Toothpaste - which you can get here for £8.48. I actually think this toothpaste works, I noticed a real difference when I used it - so did people who didn't even know I was trying a new toothpaste so that is always good. I wish I took a before and after photo but it really didn't occur to me. Since I have stopped using it I am really missing the effects of it. I also like how it is non-abrasive so this means that it isn't too harsh on your teeth or gums, which is important to me as I am pretty teeth OCD. Because it doesn't go in all guns baring it does mean that it isn't a quick fix, and it certainly isn't the quickest or strongest teeth whitening on the market. But to be honest, I am okay with that since I would rather not risk long term damage to my teeth when I am only a young 'un! It is also quite expensive - certainly not the cheapest option at on its way to a tenner. But I justified it to myself as it is cheaper than professional whitening and it is not too expensive that I begrudge it. You do go through it quite quickly as well, so be warned! Not ugly at all! And I will be buying it again! If you try it out, or if you have in the past let me know what you think! Nice review and a good blog. :) Have you tried any other whitening products? I can really recommend you to try out strips from Stella White, amazing result! Not yet! Thanks for the recommendation, I'll check them out!